This holiday home is situated in a hamlet in a rural location just 5 minutes drive from the market town of Ruffec. This home is very comfortably furnished with large spacious bedrooms. The raised terrace overlooking the garden is ideal for dining with a large table and gas bbq. 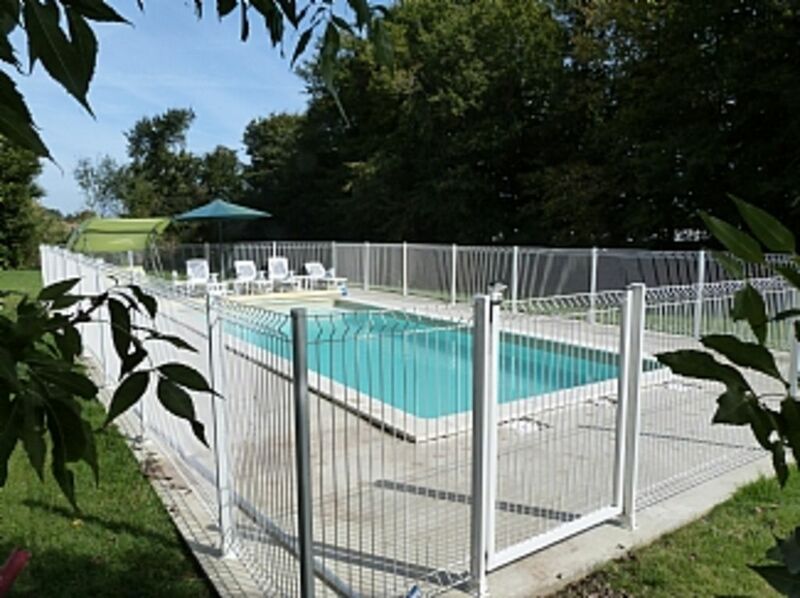 The pool has a child proof fence, compling with the latest French Regulations, and an integrated paddling area for the children. The water in the pool is purified by an ionising unit which gives clean, clear, sparkling, pure water to swim and play in. The garden is quite and peaceful with various fruit trees. The guests are welcome to the fruit in season. There is a train station in Ruffec with regular trains to Paris, Poitiers, Angouleme and Bordeaux. Enjoy picnics at the river and lake beaches with picnic areas and restaurants just a short drive away. Deirdre & Chris live in Dublin, Ireland. Deirdre is Irish and Chris is from Ayrshire, Scotland. They bought their house in France in 2009 and called it Suaimhneas (Gaelic for tranquility). It didn't take long to come up with this name as you only have to sit in the garden for a short time to experience the tranquility. They love touring the area and finding beautiful villages and river/lake picnic and bathing areas of which there are lots in the area. They also like being close to the railway station in Ruffec with its TGV service which gives them the opportunity to travel all over France and the Continent. Although the area is rural the market town of Ruffec is only 5 minutes drive away, Angouleme is 40 minutes by car and the beautiful city of Poitiers is also about 40 minutes drive. La Rochelle is about 100 minutes drive. Being so close to the N10 makes it a very easy drive from the ferry ports, it is dual carriageway and motorway almost all the way. It also means that Angloume, Poitiers and Bordeaux are all an easy drive away. The train station in Ruffec has a regular service including a TGV service. The new swimming pool is ideal for lazy days in the garden, an evening swim after a days touring and indeed a wake up swim in the morning. The pool has a childrens section with steps leading down to the main pool. There is an ionizer fitted to the water filtration system. The mature trees give great shelter on hot days or sit among the fruit trees in the orchard if you prefer. The main bathroom is on the ground floor it has a full sized bath, a separate shower and wash hand basin. There is a separate WC on ground floor. Upstairs in bedroom 2 there is an en-suite with shower, wash hand basin and toilet. 2 Settees, coffee table, side tables, LCD TV, satellite TV, DVD player, iPod dock with CD player & radio, board games, including chess-set. Selection of books. Cooker, dishwasher, microwave, large fridge with large icebox, toaster, kettle, coffee peculator. The kitchen is very well equiped with utensils and cooking equipment. The dining area has a table and six chairs + highchair. A number of golf courses, including Golf Club de Poitiers-Mignaloux-Beauvoir, Manoir de Beauvoir, 635 route de Beauvoir, 86550 Mignaloux Beauvoir. This is 18 holes, 6599yrds, SSS 71. This course is only one hour from Chez Branger. It also has a driving range and a Pitch & Put course. Angoulême Golf de l'Hirondelle, Champ-Fleuri, Chemin de l'Hirondelle, 16000 Angoulême 18 holes, SSS 69.7. This parkland course is only 45mintues away. You can hire clubs, trolleys and carts at most golf courses in France. Notes on accommodation: No smoking. No pets Outside: Private swimming pool with ionised water and childrean's area, surrounded by large patio with sun loungers and tables. One acre garden with large mature trees and fruit trees - lots of lovely shady areas to relax. The terrace has a large wooden table and six chairs for al-fresco dining. Utility Room: Washing Machine, Iron and Ironing board. Cleaning / Towels / Linen / Maid service: Cleaning between rentals. All towels and bed linen are provided including pool towels. A change of linen is provided for stays of two weeks or more. All cleaning materials and supplies are available for your use. Deirdre’s place is a lovely villa in a charming part of the Charente. The villa was really well equipped for us as a family with 3 young kids, there were plenty of outdoor games to keep them amused, as well as a swing in the garden and of course the wonderful swimming pool! The garden itself was lovely- huge with lots of fruit trees and lawned areas. The house is nice too and the bedrooms were huge! Deidre was very helpful and prompt in replying to any questions we had. Overall I would have no hesitation recommending this holiday rental, and this part of France too. We all had a great time. Thanks Ellie for the review. We are so delighted that you enjoyed your stay at our gite. A great cottage, well equipped and comfortable. The large garden and a good sized swimming pool made this a great holiday, and the outdoor gas BBQ and seating area made for great evenings. Well organised, good communication with the owners made this a smooth stress-free rental. Thoroughly recommended. Thank you for your review. We are delighted that you enjoyed your holiday. A really lovely house in a very quiet area, surrounded by fields of sunflowers. The house is a nice size with 3 large double bedrooms, patio with gas BBQ for outside meals and a lovely pool. Ruffec is only a few minutes drive away for local shops, cafés and supermarkets (and a small market twice a week) but there is very easy access to good roads for trips further afield . Our favourite days out were spend in Jarnac (Courvoisier distillery), canoeing on the Charente and at the chateau in Rochefoucauld, but we also spent lots of time enjoying the pool. We had a great 2 weeks here and would very happily return - to this area of France and to this property. A spacious gite with 3 very large bedrooms. It has a huge garden, with a fabulous private swimming pool, complete with sun loungers. There is a large gas fired BBQ on the terrace overlooking the garden, perfect for relaxing in the evenings. Good location, only a few minutes away from Ruffec, a busy market town with a good selection of shops and restaurants. There is a train station in Ruffec with a regular service to Poitiers and Angouleme. We recommend the markets in Civray and Aigre as well as Ruffec. All in all we had a wonderful holiday and can't wait to return. There are lots of local fishing lakes and the Charente river close by. Sailing is available near Angouleme and Kayaking on the Charente. There are several river and lake beaches with swimming, picnic areas and restaurants in the area the nearest is about 10 mins drive from the house. Chez Branger is just off the N10, with the following distances to airports and ferry ports. Airports: Poitier 55mins. La Rochelle 1hr 40mins. Limoges 1hr 55mins. Bordeaux 2hrs. Paris-Charles De Gaul 4hrs 15mins. Ferry ports: Roscoff 5hrs 45mins. Cherbourg 5hrs 20mins. Le Havre 4hrs 45 mins. Calais 6hrs 45mins. All time are approximate and depends on holiday traffic, road works, time of the year and weather conditions. Please check times before you travel. The market town of Ruffec with its shops, cafes and restaurants, is only 5km away. There are two large supermarkets and local market on Wednesday and Saturday. Or 15 minutes in the opposite direction is the lovely town of Civray, with its Friday market devoted to good food. Futuroscope theme park or Parc du Futuroscope, is on the outskirts of Poitiers, which is only 55 minutes from the house, along the N10. Chez Branger is close to the department boarders of Charente, Vienne, Deux-Sevres and just over 35 minutes from Charente-Maritime, so is well placed for touring around. Ryanair flies to Poitiers, Limoges and La Rochelle from Bristol, Edinburgh, Liverpool, Manchester, Stansted, East Midlands, Dublin & Cork. Chez Branger is surrounded by countryside with fields of sunflowers and maze. Quite lanes and woodlands and the Forest of Ruffec just along the road. Ruffec has the following: Tourist Office, Sport facilities include; Swimming Pool, Gym, Tennis Courts and Sports Centre. There are 2 Supermarkets, Cafes, Banks, Bars, Garages, Restaurants, Library, Pharmacies, Butchers, Hairdressers Boulangerie and a Post Office. On Wednesday and Saturday mornings there is a market selling arts & crafts, vegetables, fruit, fish, dairy products and meats. Ruffec also has Doctors and Dentist, as well as a Hospital with A+E department. Just 5km from the house is Taize-Aizie with its Adventure Climbing Centre. Near to Romagne, in Vienne, is " La Vallée des Singes" (Valley of the Monkeys). A great day out for all the family and is only 35minutes from the house. Sauze-Vaussais, in Deux-Sevres, is only 15 minutes away and has a good size supermarket, with shops and cafes and bars. There is a fishing lake in the town, with picnic/BBQ areas as well as children's play-ground. 35 minutes south of the house and just north of Angouleme is the lake of "Plan d' Eau de La Grande Prairie" with it's fishing, sailing, cafe and swimming with a lifeguard protected swimming beach. Near by is the ultra modern "Nautilis" swimming and sports centre. There are lots of beautiful bathing areas in the locality. At St. Macoux, which is only a 10 minutes drive from the house, there is a lovely swimming area which has a bar/restaurant, picnic areas, lifeguard and play area. La Rejallaint in Ruffec with its beautiful picnic and swimming area on river is a must. Booking Notes: A deposit of 25% of the total amount is due at the time of booking. This deposit is not refundable. Final payment will be due 40 days before your holiday commencement date. Payment can be made via PayPal or Inter-bank transfers are also acceptable. A breakage/damage deposit of 250Euro will be levied at the time of final payment and will be refunded normally within 5 working days after your holiday. Changeover Day: Change-over day is Saturday and Guests check-out is no later than 12 noon. Check-in from 3pm to 7pm.